Every year when Memorial Day rolls around I get so excited to officially kick off summer! I’m all about sporting my patriotic colors all summer long – bright reds, shades of blue and crisp white (I especially love stripes in the summer!). So here’s a few of my favorites that I’m loving lately! Also, Nordstrom’s Half Yearly Sale started today through June 4th. Click here to start shopping the sale! I love how these picks are a mixture of classic and trendy! Such cute clothes! What chic outfit ideas, Rach! I love everything you’ve included in this set, so cute and full of detail. I especially love 7 and 13! Thanks for sharing and I hope you have a great day! I completely agree! I will be rocking a red lip this weekend. 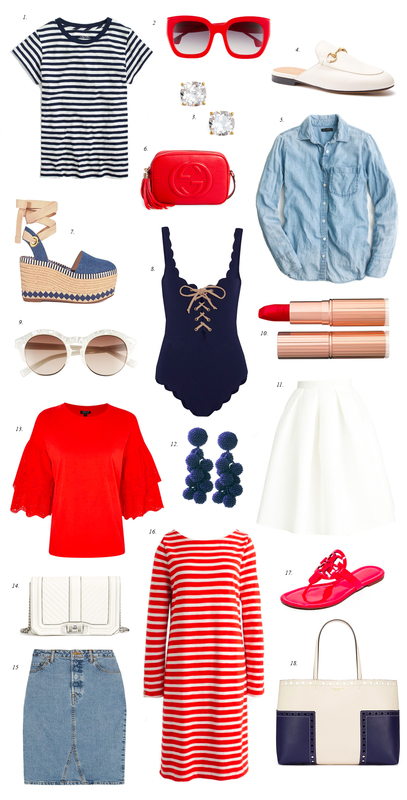 Thank you for the red, white and blue inspiration! Thanks Keri! Glad you liked! Gotta love a striped shirt with a red lip to ring in summer! I am so excited for this weekend and the kick off of warmer, sunnier days. Love that scalloped suit too, very cute! loving the uber-chunky espadrilles! How fun are those!? I know, I love them too! All such cute pieces for Memorial Day! I really like the red and white dress! Great picks!!! I just got the Gucci Disco and I’m obsessed! I kind of want it in every color! These are perfect for the upcoming holidays! Especially, number 13 and 7. So cute! Love that bathing suit and striped top!! Loving these nautical vibes! Soon it will be fourth of July!!! Yes, you do need that bag ;) Both of us do! Can you give me some suggestions of what to wear with the chambe shirt? Thanks!! !